I'm going to take the fixed wheel frame and the HooKooEKoo to a powder coater up in Renfrew. They look like they might do fades and such. I'll see what those two come out like. If they're good I was thinking a dark green/ crimson dark red fade Whad'ys think? I've picked up a pair of Salsa forks and have a Salsa stem and the Groovy bars. BTW any colourschemes gladly listened to. Justification is...well none really, I kinda think the Salsa is a touch wee and this is a bit bigger but its shaping up to be a different build. I guess I wanted to try one out too, won't get another opportunity at that price. EDIT: the pic above is Nicks and he's 6'1 and is set up accordingly, he says its comfy rather than stretched and is his smallest 19" bike if you know what I mean. Last edited by kaiser on Tue Apr 12, 2011 9:50 pm, edited 1 time in total. Cheers for the font work chaps, I'll persist with contacting Vicious the noo. an exact match will be out there and might take less time to find than a font editor - I've spent today (7 hours) reworking one and I'm only half way through. 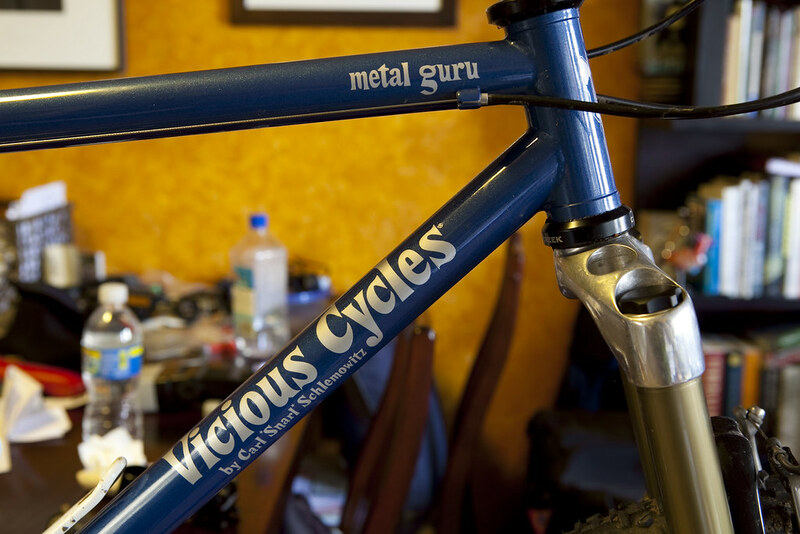 Although just "Vicious Cycles" on its own would be a lot less than including "Carl *Snarl* Schlemowitz"
time to change your laggan banner TK? Oh, somebody posted a silver/crimson fade with green forks and stem recently, can't find the linky though, but I thought that was rather spiffy, the green went really well too. Last edited by zigzag on Tue Apr 12, 2011 11:00 pm, edited 1 time in total. Aye, 'Vic *Vic* Clesy' would have been much more reasonable. Selfish b*gger.